← The Fanscient No.8 Summer 1949 – The Robert Bloch Issue – A Complete PDF File with JPG’s Available Too! Fritz Leiber, Robert Bloch and Others Discussing H. P. Lovecraft in 1963 – A Complete PDF File, with JPG’s Available Too! 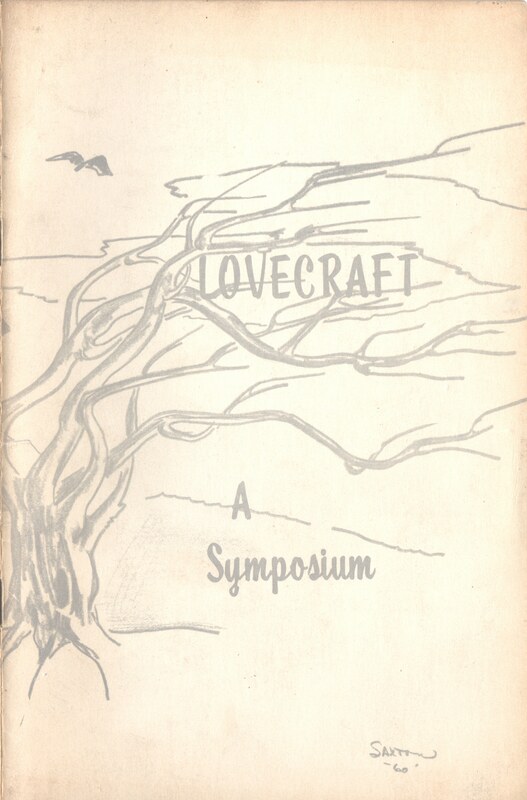 Lovecraft: A Symposium (per the cover), or H. P. Lovecraft: A Symposium (per the title page), or Symposium On H. P. Lovecraft (per the first transcript page) was transcribed from the recording of the panel discussion on H.P. Lovecraft at the 24-October-1963 Los Angeles Science Fantasy Society meeting. The panelists were: Fritz Leiber, Robert Bloch, Sam Russell, Arthur Jean Cox, and Leland Sapiro; and annotations to the transcription were provided by August Derleth. I believe this nearly 47 year-old booklet is now well into the public domain; and I will remove it if a current copyright holder contacts me with a request to do so. I am providing these scans freely from my collection as a tribute to Fritz Leiber and Robert Bloch. Please let me know in feedback if there is an interest in more documents and images like this. This entry was posted in Documents, Flickr Updates, Fritz Leiber, H. P. Lovecraft, H. P. Lovecraft Symposium, The, PDF Files, Robert Bloch, Scans and tagged 1963, Documents, Fritz Leiber, JPG, LASFS, Lovecraft, PDF, Robert Bloch, Scans, Symposium. Bookmark the permalink. 2 Responses to Fritz Leiber, Robert Bloch and Others Discussing H. P. Lovecraft in 1963 – A Complete PDF File, with JPG’s Available Too! This is a fascinating document. I especially enjoyed the parts where Bloch put the proper perspective on Lovecraft’s work by showing how the horror induced by Lovecraft’s stories were directly related to the times when the stories were published, and by the experiences of those who lived in those times.